Gautam Prakash : The Un-natural Act: Kitchen Love! 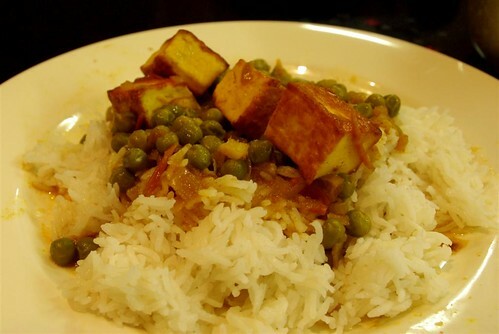 This post is not a recipe for Matar Paneer. If you are looking for that, please use Google. Well, yes, you will end up with an amazing meal but you will have to follow each instruction, so if you don't like beer or 'The Who' playing live for hundreds of thousands of 'freaks', my apologies! Food is all about living, so is music! 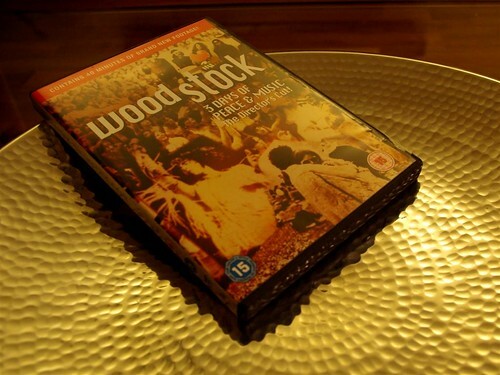 No music collection is ever complete without the Woodstock album. The first step, therefore, is to plonk in the DVD. No pirated copies on your laptop please, Woodstock deserves better! Matar Paneer's on the menu tonight. If it's not to your taste, too bad it is the only one on the list. 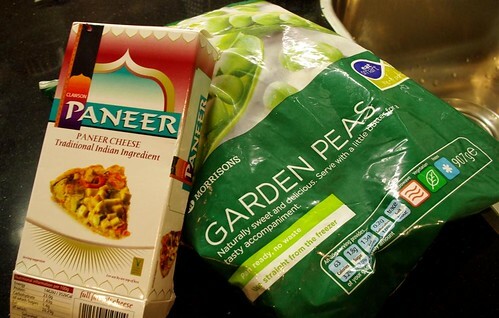 Frozen Peas and Paneer works just fine. Keep them out of the refrigerator before you begin. You won't have to struggle with the ice later. Onions! The more, the merrier. 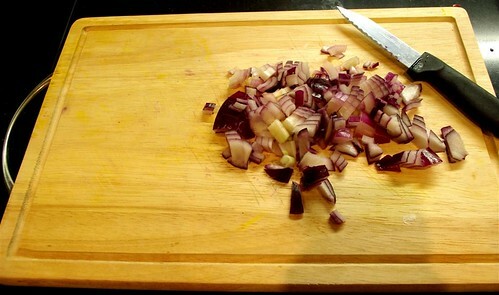 Ideally, I would like to chop in at least one red onion per person. Too bad I had only one to cook with! 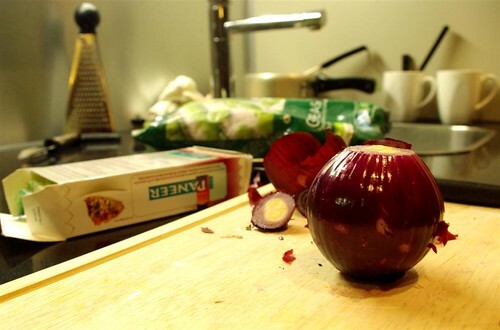 Chop the onion as small as you can. If you have a blender or a mixer, even better. Churn it into a paste. Also, chop a small piece of ginger. You can always use ginger-garlic paste. But nothing beats the aroma and flavour of fresh cut ginger and garlic. 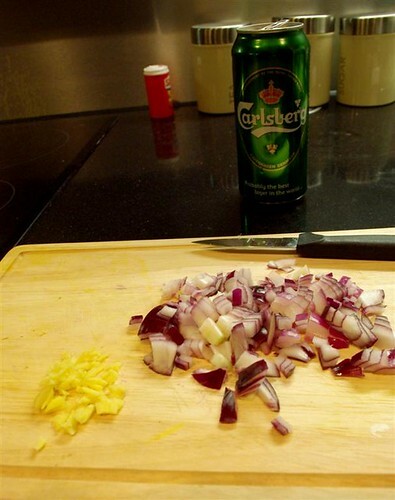 If you are putting your onions into a mixer/blender, put in the ginger and garlic as well. This is checkpoint 1 - you get a beer! Time to get cooking. 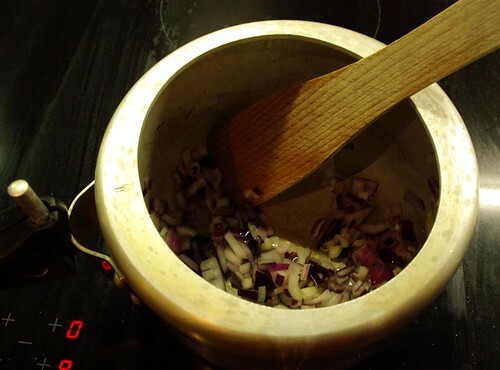 Heat some oil in a pressure cooker and put in the chopped onions/onion paste. Fry till onion is fried brown. Put in the chopped garlic and ginger. Fry for a few more seconds. Cook them with the onions. Also put in a 1/4 glass of water. Cook for a few minutes till the oil starts separating. 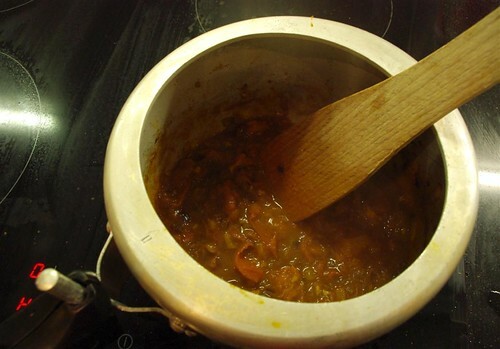 In the meanwhile, quickly chop a tomato into small pieces and put them in the cooker. Squash them with all your might! Add salt! 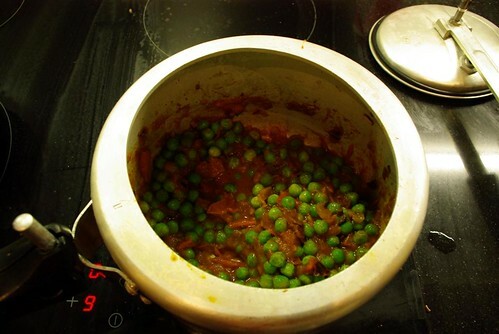 Once the tomatoes are squashed and cooked (you would know when you can't recognize one thing from another), put in the green peas and cook for around two minutes. Add around two cups of water or as you wish. Once done, close the cooker and let it heat on full heat. 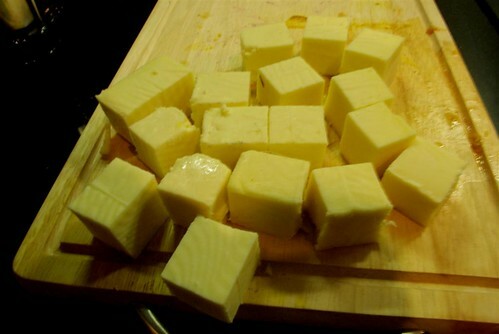 While the curry is cooking, it is time to get the paneer out of the packing and chop it into small cubes. 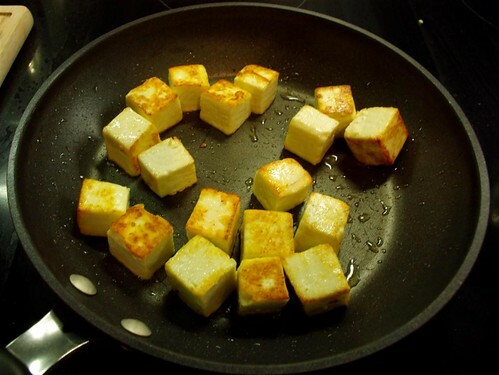 I always love the paneer a wee bit fried in Matar Paneer, and believe me, it's worth the extra effort. Just put in a little oil on the pan and saute the paneer cubes in it. Make sure the food is not the only thing adding to your belly. Have some beer. 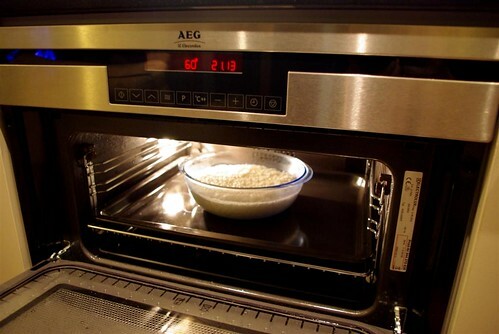 Optimize the cooking time. Put in the rice to cook in the microwave. This is the easiest bit for people who don't know. Put in twice the water. 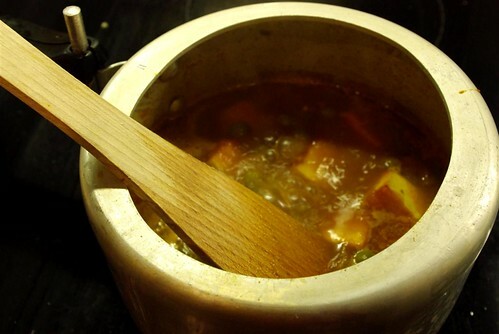 Once the cooker whistles, lower the heat and let it cook for a minute. Release the pressure after this and put in the fried paneer pieces into the curry. Cook it on medium heat. Finally, an optional step. No north indian meal is complete without roti. 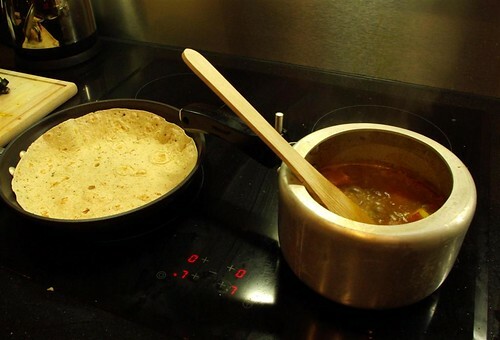 To add a mexican flavour, (just being lazy) heat some tortilla wraps/frozen chapati on the pan. Let the matar paneer cook on medium heat in the meanwhile. Comment on the amazing instructions and enjoy the meal! PS: Sorry for the shortcomings in any of the pictures. I am still getting used to not putting my DSLR on the stove! 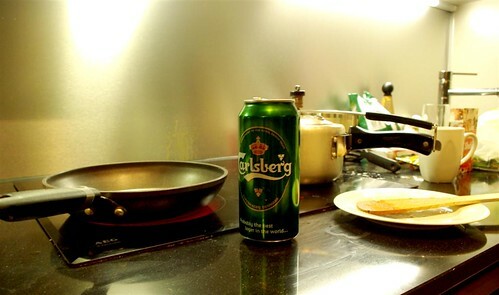 good post.....with all the pictures :) ...by the way...tried ur hands at cooking for the 1st time kya? ?......waise even i cook it the same way 'paneer a little fried'...nd it is really worth d extra effort! Thanks Arun, Smriti and SK! yummm.....I want some mutter paneer and beer NOW! Well the paneer indeed looks very yumieeeeee.. It was interesting ! keep it up dude. you have some snazzy kitchen appliances!